I'm going to try to do the one-card draw writeups in small batches, and I'll start getting the full readings up as soon as I can. Madame Destiny settles herself in her yellow and lavender muu-muu, adjusts her matching turban, and shuffles her large deck of cards. One beringed hand snaps a card out of the deck and deals it onto the melamine tabletop. The card depicts a woman with a generous hourglass figure dressed in a black fencer's outfit, complete with a mask that utterly obscures her face. Her formfitting bodysuit is black, with a bright red embroidered heart in the center of her chest, and white, very thorny, roses embroided around it and sprawling organically over the rest of her suit. She holds her sword (too substantial to be a foil) in a fencer's salute. The card is upright to you. "This is L'escrimeuse," Madame says, tapping the card, "who was part of the French Resistance during the War. In this deck, she stands as the Queen of Swords, and embodies the use of words, decisions, or perception. L'escrimeuse was most famous, you know, for an episode in which she disguised herself as a male SS officer and managed to evade detection by even the Nazi psychics through a combination of a quick tongue and her ability to notice and play on the non-para distrust of, particularly, Herr Wutstau, who could manipulate people's emotions. She got away with the plans for the Blitzfestung, a para research and production low-orbital facility, and so the Gold Star Brigade was able to destroy it during construction." Madame takes a sip of her iced tea. "But I do ramble on so. L'escrimeuse here means, I think, either a woman of great perception and decisiveness, someone with a great facility with words and persuasiveness, or, perhaps, a need in your life for this sort of decisiveness and perception, this feminine -- to my mind -- ability to see what must be done and decide to just go out do it, hang all the costs. A fixed determination to focus on the point of the thing, to the exclusion of annoying shiny distractions, and that kind of Quixotic gallantry I always associate with these kinds of women." "I hope that helps you, dear," Madame concludes. "Do you know, I met L'escrimeuse much later in her life. She was a great lady, you know, entirely self-made, and ran all sorts of international philanthropic organizations. I asked her about the rumor about her sword, that it was Jeanne d'Arc's own sword, and she laughed. 'I have so many swords, Madame,' she said with that sort of Gallic hand-waviness I always admire so much. 'So many were broken, I always had to have new ones. But perhaps I did have a magic sword or two, and they helped me along. Swords, you know, are always so good at getting to the point of the thing.' And then she laughed." Madame Destiny is wearing a truly amazing scarlet and bright yellow tie-dyed ensemble that appears to be a long, gauzy tunic blouse with sweeping sleeves over an ankle-length skirt, and her long, chunky string of red carnival glass beads rattles distractingly against the tabletop every time she moves. She has rather fewer rings than usual, but rather more translucent plastic bangles, and her nails have recently been painted red. Her turban is adorned with a sparkly fascinator and red-orange feathers. With more dexterity than one might ascribe to those somewhat aged hands, she shuffles the oversized card deck and flips a card out onto the table. The card shows eight heavily-armored forms -- familiar as the iconic Guardians -- blasting off into a night sky, rockets blazing behind them, leaving the countryside behind. Each of the Guardians is a different color. The card is upright to you. "I'm sure you recognize this group," Madame Destiny says, dimpling mischievously, "though possibly you never knew there were eight of them. We're familiar with Gold, Silver, Copper, Bronze, and either Iron or Steel. But originally -- on their first mission, which this card shows -- there were eight: Gold, Silver, Copper, Bronze, Brass, Iron, Steel, and Lead. This card stands for the eight of Wands in this deck." She picks up the card and studies it briefly, then sets it back down. "As I said, this was their very first mission after they came to work for the military: blasting off to deal with the Sky Fortress Re del Cielo. You see, the Guardians were the first privately-funded para team to put themselves under the auspices of the military as civilians. The government could have drafted them, you know, and would have if they hadn't volunteered, but their financial backer, the person who only called him-or-herself 'the Platinum Guardian', was, according to rumor, someone very close to President Roosevelt. So they were allowed to volunteer. In any case, they had only minimal preparation and training before being sent out on their first mission, you know. And they had some terrible losses, though it was ultimately successful." "The message here," she says, pointing to the card, "is that you've got a lot of energy building for a major move. It's there! It's energy!" She waves her arms about, bangles clanking furiously. "But you need to be prepared before you go blasting off with all that energy and drive. But I think that you're in pretty good shape, seeing as the card is upright. Just keep your head and you'll be fine." She cuts the card back into the deck and adds, "I hope that helps, dear." Today, Madame Destiny is wearing a loose, flowing royal purple dress and matching turban, with a double string of faux pearls. She is settled at her familiar table in the Stars 'n' Garters with a cup of tea and her cards. Her rings are full of chunky flashing gems and glass, no telling which is which. She shuffles the deck and crisply places the card she drew on the table. The card depicts a young blonde white woman in a smart blue military-style cutaway jacket with red epaulets and red trim over white trousers and black boots, clearly meant to evince a Revolutionary War soldier while many of the elements match more modern uniforms (the collar, the shirt, and her rank insignia, the double gold bars of an Army Captain). Her hands are folded on the hilt of a naked sword whose point is planted in the ground between her feet, and a badge showing a set of golden scales is pinned to her left lapel. Her blue-eyed gaze is intense and compelling. The card is reversed to you. "Well, here is our friend, Lady Justice," Madame Destiny says, smiling past you at the elderly woman sitting at a nearby table. The woman chuckles. "But alas, she is reversed: I generally call that Justice Suspended, but it could also be injustice. 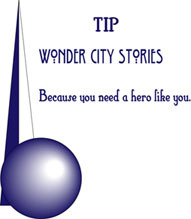 You know Lady Justice's history; you've read little Ana's fabulous story about her, yes? I think that Lady Justice frozen in ice by one of her allies is the best illustration of this card's reversal. She was both unable to carry out her own pursuit of justice, and she was also the victim of injustice." "I always love hearing you give readings on this card, Madame," Lady J says. "Do I make it awkward for you?" "Oh, no, darling, you're an admirable audience and you can always tell me if I get your story wrong," Madame says. "It's become so much easier to read the card for people since they read the story." "Sorry about that little digression," Madame says, putting her fingertips -- light purple sparkly nail polish and all -- on the card. "Here, I think, is a message that what you feel is right or fair is not happening somewhere near you or to you. And it isn't. But it's only for now, I think." "Not a permanent reversal?" Lady J says, smiling. "Nothing is actually permanent," Madame says, vaguely dismissing the suggestion. "Reversals reverse, it is the nature of all things. Be patient, dear. I can't say for sure what will happen, but the only thing for sure is that things always change." She leans across and pats your hand. "I hope this helps, dear." Thanks! I like coming up with some more WWII heroes (I had more than a dozen I'd brainstormed a long time ago, but I needed more!) for this project, and I'm looking forward to cooking up more historical tidbits. Thank you, that's brilliant! I am fond of Justice--the card and the concept--so I'm glad to see her make an appearance on my behalf, even if she's currently Reversed. Fantastic. The dollops of backstory, like the Eight Guardians narrowly avoiding the draft thanks to wealthy private financial backing, again reminds us that this isn't our typically autonomous, wealthy superhero collective. In the third reading, I love having the embodiment of the card sitting by listening to the card being described. There are frames of reality / symbolism/ active imagination going on here to make me squee. Thank you! I hadn't seen this for some reason when you posted, but I'm glad I came over here this morning.